Yesterday, July 18, was the last day for teams to sign their draft picks from the 2014 MLB Draft, and the Dodgers ended up inking 33 of 40 draftees. Late additions to the Dodger family include 23rd rounder Andrew Godbold and 38th rounder Caleb Ferguson. 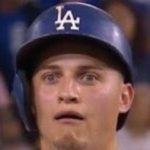 Godbold was listed as signed by Baseball America and also lists himself on Twitter as a Dodger. Ferguson made his announcement on Twitter and is a particularly interesting signing since he just underwent Tommy John surgery in May. Worth nothing that the team officially lists only 30 signees so far, but I’m assuming that the other three are just not official yet. If not, then either news sources or the players themselves were very wrong about something. Also, Eric Stephen of True Blue LA has 32 out of 40 draftees signing and I’m pretty sure he’s going to add Godbold sooner than later as well. Assuming none of the signees from rounds 11-40 have bonuses over $100,000, the Dodgers finished this signing period $200,900 over the cap, which is 4.06%. That subjects the Dodgers to a tax of 75% on their overage of $200,900, which amounts to $150,675. If any of the signings from rounds 11-40 do go over the limit, the Dodgers have only $46,484 to work with before they trigger the serious draft penalties. Obviously they don’t want to go there. Up to 4.999 percent over ($5,195,084) the team pays a 75 percent tax on the amount over. Up to 9.999 percent over ($5,442,469) the team pays the 75 percent tax on the amount over and loses next year’s first-round pick. Up to 14.999 percent over ($5,689,854) the team pays a 100 percent tax on the amount over and loses next year’s first-round and second-round picks. From 15 percent ($5,689,855) and up the team pays the 100 percent tax on the amount over and loses the first-round pick for the next two years.